(At left) Sam Chew Chin. Credit: S. Chin. (At right) As a Directorate Fellow with the US Fish and Wildlife Service in 2017, Chellby Kilheffer aided in bog and spotted turtle surveys. Credit: C. Kilheffer. Mid-October 2018 Update: Both of NYSG's 2019 Fellows were of the 46 named as Knauss Executive Fellows, having received their work assignments during a week-long placement week in mid-October (Legislative placement week for Knauss Fellows will be held the first week of December). 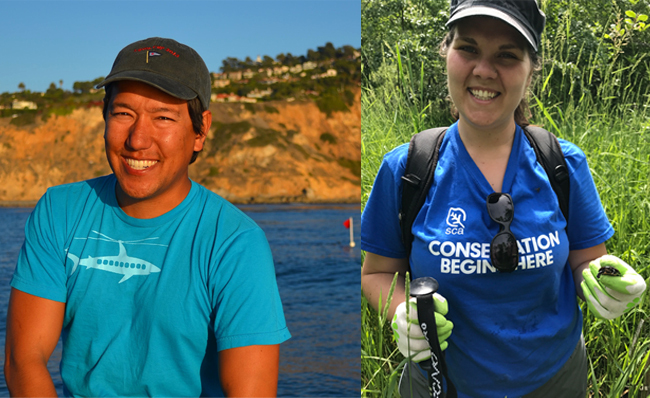 NYSG's Executive Fellows will be working in non-legislative offices in Washington, D.C.: Sam Chin will report to NOAA National Marine Fisheries Service's Office of Sustainable Fisheries-Recreational Fishing; Chellby Kilheffer will work for the U.S. Fish and Wildlife Service's Ecological Services. Washington, DC, July 10, 2018 - It used to be that turning 40 meant buying an expensive sports car. But the John A. Knauss Marine Policy Fellowship, which marks its fifth decade as a program this year, is doing the equivalent of competing in a second, third—or fortieth—marathon. In 2019 two finalists from New York will be lacing up their running shoes. They will serve among the program's 66 national finalists, whose details can be found via the National Sea Grant Office's website, www.seagrant.noaa.gov/Knauss. The two awardees from New York, Sam Chew Chin and Chellby Kilheffer, have been identified in the Executive cohort. This means that in mid-October these two graduate students will visit D.C., where, if placed, they will be matched with "hosts" in the U.S. executive branch of government for a one year paid fellowship. 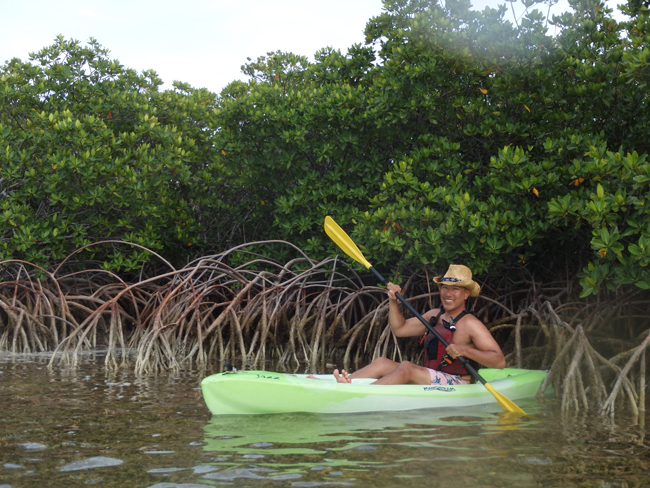 Chin in a kayak in the Florida Keys, applying environmental DNA (eDNA) for the study of mangroves. Mangroves are an important nursery and refuge habitat for fishes, but almost no one studies their interiors since their roots and branches make most fish surveys methods impractical or impossible. Chin is hoping that eDNA can offer new insights. Credit: S. Chin. Chin is a graduate student in biology at the City University of New York. 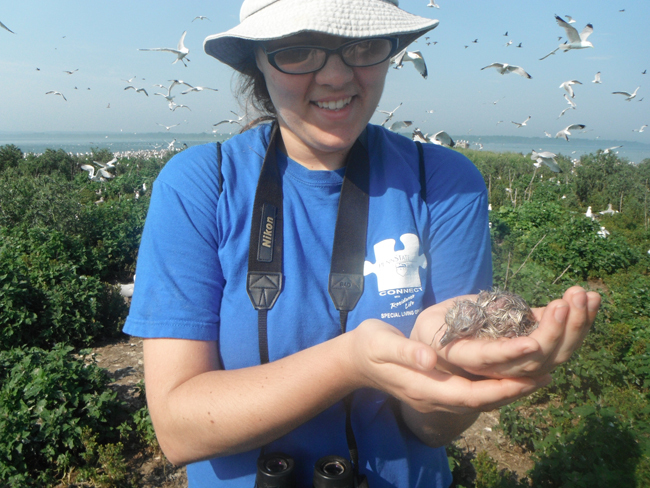 In Kilheffer’s first field experience, as an undergraduate intern in Brighton, Ontario, she banded common terns. Credit: C. Kilheffer. Kilheffer recently completed her Ph.D. in fish and wildlife biology and management at the State University of New York College of Environmental Science and Forestry (SUNY ESF). "These two awardees from New York earn this recognition at a significant time, both for the Knauss program, on its 40th anniversary, and for marine conservation and policy generally," said New York Sea Grant Interim Director Kathy Bunting-Howarth. "We at New York Sea Grant are delighted that two of our applicants, Chellby and Sam, have risen to the top in this highly competitive fellowship program. The two from New York we honor today show promise of carrying coastal science and policy forward for the next 40 years and beyond. I am confident that they will have very successful fellowships." 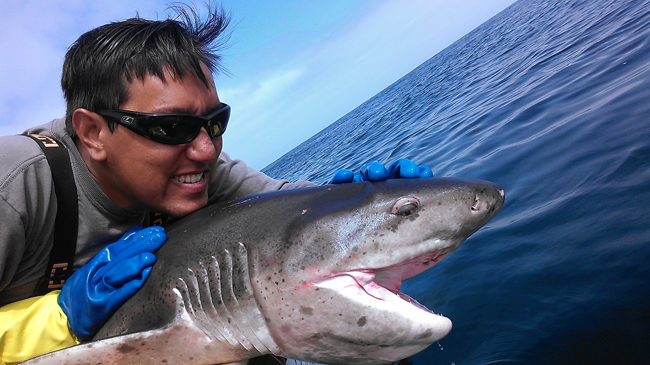 A broadnose sevengill shark off the coast of California with Chin. Credit: S. Chin. "It is quite an honor to have been selected, " said Chin. "It will be a bit of an adjustment to trade my waders and lab coat for a suit and tie, but I am eager to see how ecological research is integrated with economic and political concerns to form policy." 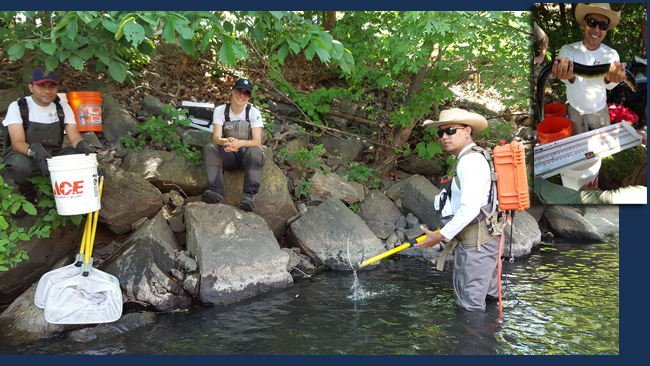 In the orange backpack is the electrofisher that Chin uses to catch eels, also on the Bronx River. (Inset) Chin with an American eel, the main species he studies, on the Bronx River. Credit: S. Chin. "In academia, we strive for publication, but what we're really after is action," continued Chin. "We publish so that others may act on our findings. For fish ecologists, the federal government is a big part of our target audience. The chance to spend a year working at the federal level as a Knauss fellow is a chance to take part in some of that action directly. I was excited just to learn about the opportunity, and now that I'm a finalist, I'm excited to see where I can take it." Kilheffer monitored radio-collared white-tailed deer in the Otis Pike Fire Island High Dune Wilderness Area on Fire Island National Seashore. 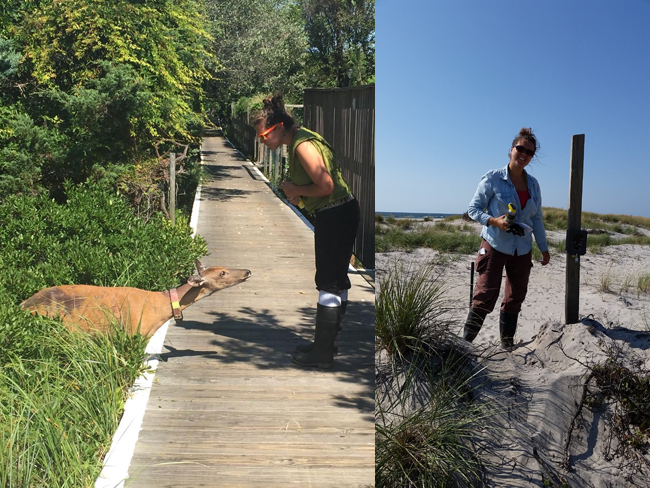 In her PhD research, she assessed the effects of deer on vegetation recovery after Hurricane Sandy. To accomplish this, Kilheffer used trail cameras in overwash fans, places where water and sediment flow over beach areas during storms. Credit: C. Kilheffer. "I am thrilled for the opportunity to work alongside professionals whose goals are to better inform policy, especially policy in coastal and marine ecosystems," said Kilheffer. "Most of my professional experience thus far has focused on field research, data analysis, and various forms of communication. I expect the Knauss fellowship to provide a variety of perspectives on coastal and marine issues, each of which will enhance how I think about ecological and environmental issues in the future. I am honored to be a finalist and I can't wait to get started!" "The Knauss fellowship is one of Sea Grant’s flagship programs," said Jonathan Pennock, Director of the National Sea Grant College Program. "Every class of Knauss fellows continues to raise the bar, and the 2019 finalists are no exception. I'm also happy to share that in response to a growing demand for Sea Grant Knauss fellows in federal government offices, we are pleased to include two additional legislative fellowships for the 40th anniversary class." Finalists for Knauss fellowships are selected through a competitive process. Students finishing master’s, juris doctor, and doctor of philosophy programs with a focus in marine science, policy, and management apply to one of 33 state Sea Grant programs. Applicants who are successful at the state level advance and their applications are reviewed by a national panel. The 2019 finalists will travel to Washington, D.C., this fall to interview and negotiate placement in executive or legislative offices. They will begin their fellowships in February 2019. Since 1979, Sea Grant has provided over 1,200 early career professionals with first hand experiences transferring science to policy and management through one year appointments with Federal government offices in Washington, D.C. Knauss alumni go on to have prospering careers in all sectors of society. Executive appointments for the 2018 Knauss fellows included placements throughout NOAA as well as with Department of the Interior, National Science Foundation, U.S. Navy, and other agencies. Legislative placements included the Senate Committee on Environment and Public Works (Minority), the House Committee on Transportation and Infrastructure (Majority), the Senate Commerce Committee (Majority and Minority), the House Committee on Natural Resources (Minority), and several placements in both majority and minority Congressional offices. Last year’s class of finalists included two from New York: Emily Markowitz and Ashley Stilson. In late 2017, Markowitz obtained a placement with the National Oceanographic and Atmospheric Administration’s National Marine Fisheries Service, in the Office of Science and Technology. Stilson secured a spot with the United States Fish and Wildlife Service’s Ecological Services Program. They began their fellowships in February of 2018. "Knauss is a once-in-a-lifetime opportunity," said Markowitz. "It provided me with a unique introduction to the world of federal policy-making, federally-driven research and development, and communication and coordination in ocean conservation and fisheries." 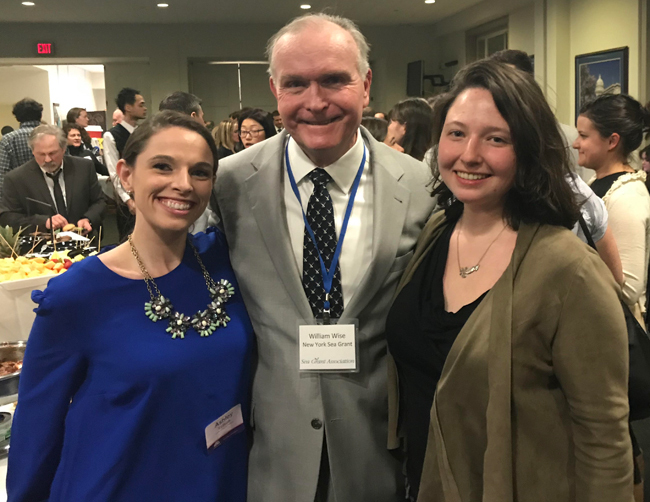 NYSG's Director Bill Wise (pictured above, middle) met with our program's two 2018 John A. Knauss Marine Policy Fellowship recipients while at an early March reception in Washington, D.C. Both of NYSG's representatives in 2018 are Executive Fellows, as they are working in non-legislative offices in the D.C. metro area. Ashley Stilson (far left) is Special Assistant to the Deputy Assistant Director at the U.S. Fish and Wildlife Service's Ecological Services office in Falls Church, VA. Emily Markowitz (far right) works in the Protected Species Science Branch at NOAA National Marine Fisheries Service's Office of Science and Technology office in Silver Spring, MD. Credit: Kathy Bunting-Howarth.